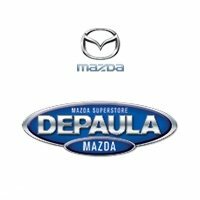 Mazda produces some of the classiest, most stylish vehicles in the entire industry, leading some consumers to assume that the brand is much too pricey. However, this isn’t the case, as Mazda surprisingly offers several vehicles for less than $20,000 MSRP. Each of these offerings provide their own specific attribute or feature, which we’ve explored below. The 2017 Mazda3 provides so many interior amenities, it’s difficult to choose where to start. I guess we could focus in on the expertly-designed seats, with engineers managing to include both comfort and opulence. The soft-touch materials will mold to the occupant’s body, thus allowing them to sit back and enjoy the journey. With the ability to choose from cloth, leatherette, or dual-stitched leather, owners can truly customize their Mazda3 to fit their liking. Regardless of your choice, you’ll surely appreciate the inclusion of the small pores featured throughout the chair. This feature doesn’t only allow the material to breathe (thus providing occupants with optimal comfort), but it can also play a role in reducing road noise. Meanwhile, occupants can enjoy the available SiriusXM Satellite Radio or their favorite tunes (via their MP3 player or smartphone) with the incredible nine-speaker Bose Counterpoint 2 Surround Sound System. This will provide an unmatched listening experience, and the noise-deafening features will only help to accentuate that audio. Drivers can even take advantage of the “Multifunction Commander Control,” which allows easy access to the seven-inch full-color touch-screen. Finally, the Active Driving Display will showcase the most essential information directly on your dashboard. That means you won’t have to contort your body to view your speed, mileage, or even directions. The 2017 Mazda3 Hatchback predictably provides more interior space than its sedan counterpart, but we doubt anyone could have anticipated this amount of roominess from the vehicle. When the rear seats are completely folded, owners can take advantage of an incredible 47.1-cubic-feet of space. Meanwhile, thanks to the inclusion of the 60/40 split fold-down rear seats, owners can easily manipulate the interior to accommodate both cargo and passengers. 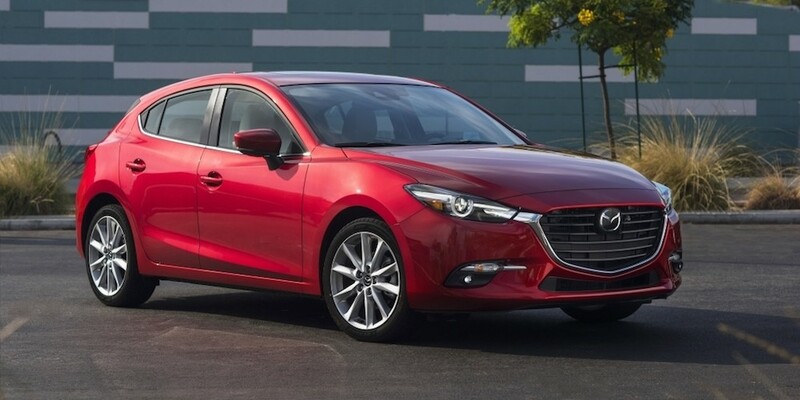 Speaking of passengers, if you’re required to bus around all of your children and their friends, then the Mazda3 hatchback is a perfect choice. Thanks to the Mazda Connect system, each of the occupants will be content with all of the entertainment options at their disposal. Meanwhile, thanks to the intuitive navigation system, the driver will never get lost as they’re trying to rush to those practices or rehearsals. While the Mazda3 sedan is generally commended for its opulence and style, the Mazda6 sedan is celebrated for sportiness. This can mostly be attributed to the unique SkyActiv-G 2.5-liter four-cylinder engine. The unit is capable of pumping out 184 horsepower and 185 pounds-feet of torque, which should be more than enough power to overcome any road obstacle. However, the most impressive attribute is the incredible efficiency, as the engine can deliver a much-appreciated 35 mile per gallon highway fuel efficiency. Engineers included several additional mechanical features to assure that drivers will always be in complete control of their car. The Dynamic Stability Control will help guide the vehicle on its intended path, preventing drivers from accidentally swaying into another lane. Meanwhile, the Traction Control System will maintain that much-needed relationship with the road. Even in the nastiest conditions, drivers can still expect optimal stoppage power from their vehicle. Shockingly, the brand even offers their customers a subcompact SUV option that is priced below $20,000 MSRP. The 2017 Mazda CX-3 provides all of the attributes that you’d expect from this type of vehicle, including spaciousness, power, and technology. However, the most appreciated attribute of the vehicle may be the array of safety functions. The brand’s i-ACTIVSENSE safety system all but assures protection, as the unit delivers a number of features that will help drivers avoid devastating collisions. For instance, the Lane Departure Warning and the Blind Spot Monitoring system will alert the driver when another vehicle has snuck up beside them, making it unsafe to switch lanes. Meanwhile, the Smart City Brake Support will adapt your vehicle’s brakes when traveling at low speeds, allowing the driver to suddenly stop their vehicle if necessary. The Smart Brake Support plays a similar role at higher speeds, and the system will notify the driver via audible and visual cues before it automatically applies the brakes itself. Finally, the Distance Recognition Support System will determine the ideal distance from another vehicle, helping the driver recognize when they’re putting themselves in a dangerous situation. There are several additional features that should influence safety. The Adaptive Front-Lighting System will help boost visibility, as this system will allow drivers to better see around corners. The High Beam Control will play a similar role, as the system will automatically activate during those dark and stormy nights. If another car is detected, your Mazda will automatically adjust to accommodate these fellow drivers. Finally, features like the Rear Cross Traffic Alert will notify the driver when an object is about to cross behind their CX-3, thus allowing them to prevent a nasty fender bender. All of these available features and functions are a big reason why the 2017 Mazda CX-3 (when equipped with Smart City Brake Support and Adaptive Front-Lighting System) was awarded the “Top Safety Pick Plus” designation by the Insurance Institute for Highway Safety. You should now be fully prepared to head into that Mazda dealership in Albany, New York. Whether you’re seeking style, sportiness, roominess, or safety, you’ll surely find said attribute in one of Mazda’s several vehicle offerings that are priced south of $20,000.